This presentation gives an overview of vestibular and auditory prostheses including how the University of Washington Medical Center is currently evaluating these cutting edge implanted devices which will hopefully help to improve the quality of life for many with chronic vestibular and hearing loss. The vestibular system includes the structures in the inner ear that contribute to balance and orientation. It includes the nerves that relay balance and orientation information from the inner ear to the brain. 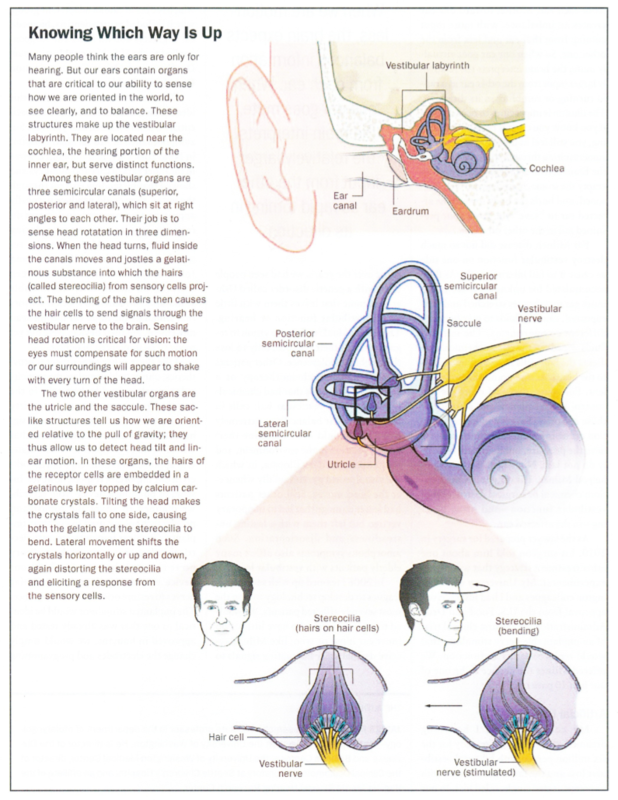 What Parts of the Inner Ear are Parts of the Vestibular System? What are the Semicircular Canals? Location of hair cells. (Our sense of balance starts with hair cells!). How Do the Semicircular Canals Work? When you turn your head fluid moves in the semicircular canals. Each ampula contains a cupula, which billows when the fluid moves, which in turn bends the hairs of the hair cells. How Do the Otolith Organs Work? The otolith organs contain a gelatinous cap (otolithic membrane) and otoliths (otoconia, calcium carbonate crystals). They also contain hair cells. When we slide or tilt, the gelatinous cap deforms, and the hairs of the hair cells bend. What Happens When the Inner Ear Vestibular System Fails Bilaterally? Is There Compensation for Inner Ear Vestibular Loss? Can We Replace the Inner Ear Vestibular System? Yes, with a vestibular prosthesis! Who Could Be Treated with a Vestibular Prosthesis? Not patients with a single acute transient loss of function. Patients with bilateral loss of balance function. Patients with uncompensated unilateral loss of balance function. Patients with fluctuating balance function. Usher Syndrome patients may already have inner ear implants (cochlear implants for hearing loss). To effectively treat Usher Syndrome vestibular loss requires a combined vestibular and auditory implant. Design a device to stimulate vestibular afferent fibers. Develop a simple surgical approach with the right target. Evaluate the device in animal model. Test the device in human patients with vestibular loss. Can the device restore vestibular function lost from the destructive treatment? 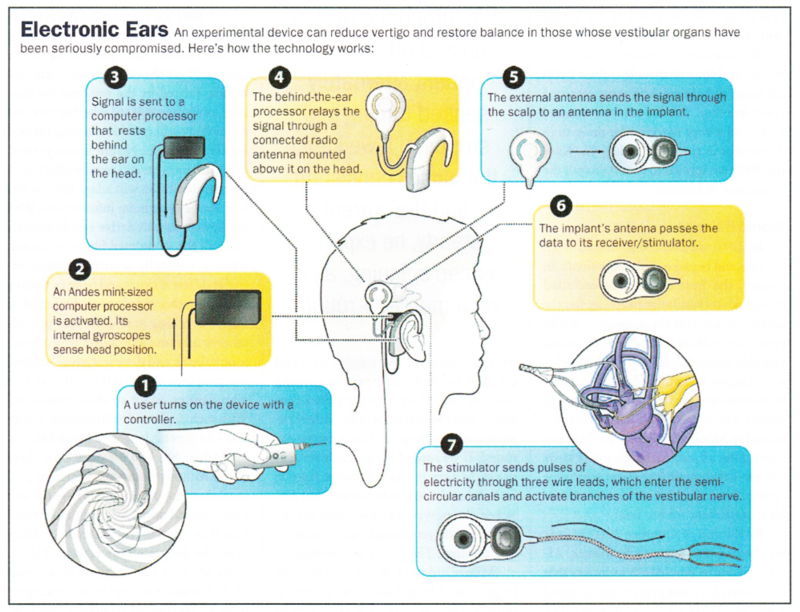 Modify our devices to create a combined cochlear and vestibular prosthesis. Test the new device in rhesus monkeys. Modify our existing FDA IDE to test patients with hearing and vestibular loss with the new combined implant. Test the new device in human patients with combined hearing and vestibular loss (2 additional patients, 6 total). We know that a vestibular implant works! We have tested such a device in animals and humans. We have an existing approval to test these devices in patients. We have built a combined vestibular and cochlear implant. We are currently testing it in monkeys. We are working with the FDA to modify our existing human trial to test this new device. We are not the only ones doing this! (John Hopkins is researching similar implanted devices). James Phillips, PhD, joined the faculty at the University of Washington in 1998 and is currently a research associate professor in the Department of Otolaryngology-Head and Neck Surgery. He is also the director of the Dizziness and Balance Center at the UW Medical Center, the Vestibular Diagnostic Laboratory at UWMC, and the Roger Johnson Clinical Oculomotor Laboratory in the Division of Ophthalmology at Seattle Children’s Hospital. Prior to joining UW, he earned a PhD in psychology and in physiology from the University of Washington. Dr. Phillips teaches in the Departments of Otolaryngology-HNS, Ophthalmology, and Speech and Hearing Sciences. He is a faculty research affiliate of the National Primate Research Center, the Virginia Merrill Bloedel Hearing Research Center, the Center on Human Development and Disability, and the Autism Center at the University of Washington. He is also a faculty affiliate of the Center for Navigation and Communication Sciences at the University of Rochester and the Center for Integrative Brain Research at Seattle Children’s Research Institute. He is on the Medical and Scientific Advisory Board of the Vestibular Disorders Association.